Bryan Calvin Hartnell (20) and Cecelia Ann Shepard (22). The Lake Berryessa attack differed from the previous two crimes at Lake Herman Road and Blue Rock Springs, in that the killer used a gun, but then switched to a knife in the brutal attack on Bryan Calvin Hartnell (20) and Cecelia Ann Shepard (22). The couple were enjoying a pleasant picnic at Lake Berryessa, by Twin Oak Ridge on September 27th 1969, almost three months after the Blue Rock Springs attack, when Cecelia Shepard became aware of a man close by, acting strangely. 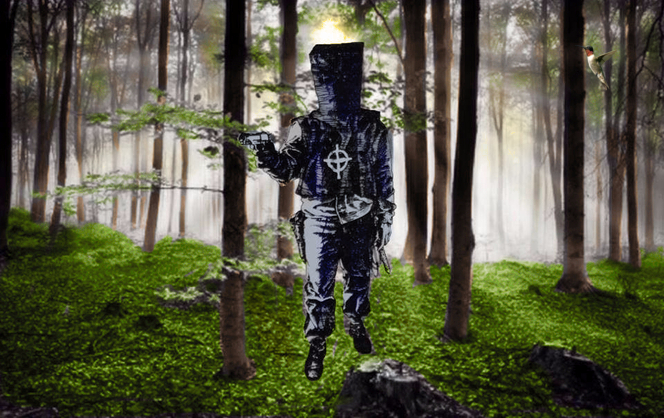 The man was observed taking refuge behind a tree, before adorning himself with a black executioners hood and a waistline bib, decorated with the now familiar trademark Zodiac crossed circle, along with a pair of clip-on sunglasses. He then approached the young couple pointing a gun, to which Cecelia would alert Bryan with the words, "Oh my God he's gotta gun." . See the relevant locations here. Cecelia Shepard would later recall these details to Deputy Dave Collins after the attack "She said: Brian and I were here on the blanket, down by the water and we're just enjoying the afternoon having a nice time talking and I saw this guy, he was coming down the hillside and he seemed to stop and watch us, looking at us, and I said what distance, how far away was he, and she pointed to an area and I said that's about 200-300 yards away, she said that's where I first saw him. Examining the tire prints at Lake Berryessa. Click to enlarge photograph. The man claimed to be an escaped convict from Deer Lodge, Montana, having just killed a prison guard and stolen a car. He requested Bryan Hartnell's car keys and money, to which Bryan Hartnell duly obliged. He then spoke to the man for several minutes to try and form some sort of rapport, in an attempt to protect them both from any harm, but the man appeared on a mission, taking some white plastic clothesline from his belt, before ordering Cecelia Shepard to tie up Bryan Hartnell. It was at this point Bryan Hartnell suggested to his companion that he felt he could make a grab for the gun, but Cecelia told him not to try anything, fearing it may make the situation worse. During this brief exchange, the assailant had stepped back two or thee feet, just out of reach and the chance was lost forever. The hooded figure then bound up Cecelia Shepard. While the couple were hogtied on the ground Bryan Hartnell asked the assailant if the gun was really loaded, to which the man pulled out the gun, took out the clip and showed Bryan Hartnell, that indeed it was. He then stabbed the victims numerous times, Hartnell six times and Shepard ten times, with Cecelia frantically rolling around, clearly terrified by her ordeal. Bryan obviously fearing they were about to lose their lives, stopped breathing in an attempt to feign death, realizing if he thrashed around the killer would return to finish him off. Fortunately for Bryan his tactic worked and the cold blooded executioner ceased his attack and walked off into the distance, back up the trail. Once the couple had managed to loosen their bindings, Bryan Hartnell then struggled his way back up the incline to the nearby road, where he was eventually aided by park ranger Dennis Land. Immediately after the 6.30 pm attack on Bryan Hartnell and Cecelia Shepard at Lake Berryessa, one key eyewitness Ronald Fong was circling the lake in his boat and responded to the cries of Bryan Hartnell. Ronald Fong turned his engine on and motored away to seek help at the Rancho Monticello Resort. It was at this point Ranger Sergeant William White received a call from Park Headquarters regarding the attack and proceeded to the Rancho Monticello Resort at 6.55 pm. It is here Ronald Fong relayed his observations to Sgt William White, as to the young couple in distress, and both, along with Archie White and Elizabeth White traveled via speedboat to the crime scene to offer assistance to both Bryan Hartnell and Cecelia Shepard. The time is now 7.10 pm. At this time Ranger Dennis Land arrived in his truck, carrying the stricken Bryan Hartnell, who had managed to crawl his way towards the road. At approximately 7.10 pm or very shortly after, Sgt William White radioed Park Headquarters to summon an ambulance and deputies to the crime scene. We know the 7.10 pm estimate is about right, because help arrived via Piner's ambulance from Napa to the crime scene at approximately 7.55 pm, and returned back to the Queen of the Valley Hospital arriving at 8.50 pm. That is an approximate journey time of 45 minutes each way, including 10 minutes negotiating the crime scene. ​Deputy Ray Land and Sergeant David Collins were dispatched directly to the crime scene from St Helena and Napa respectively. Sgt David Collins spoke on the documentary 'This is the Zodiac Speaking' "It took us a half hour from Napa and/or St Helena to arrive at the location. And we later found out of course that crime had occurred at least half an hour before we were notified." They were notified at 7.10 pm, so arrived en scene at approximately 7.40 pm. It would be a further 15 minutes before the ambulance would arrive at 7.55 pm, now of course 85 minutes after the attack, and both victims were in critical condition. The time of 7.40 pm is also the time the killer placed his call from the Napa Car Wash payphone. 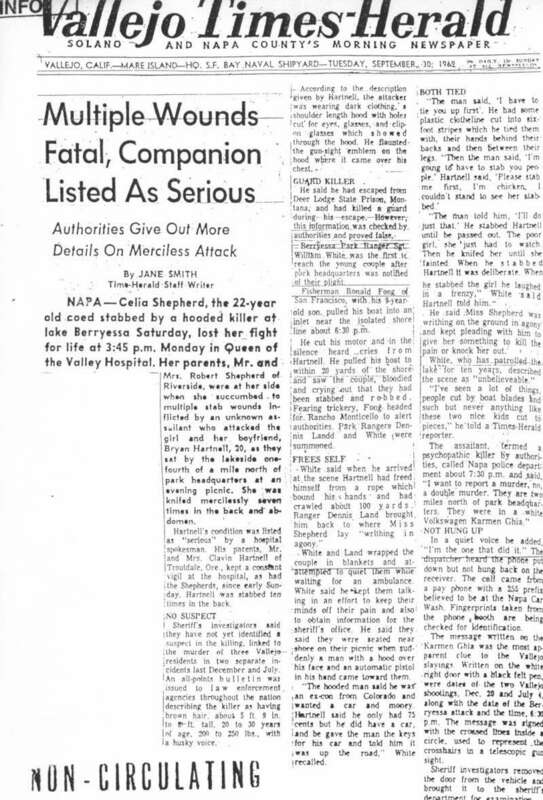 At this point the victims are being tended to by the respondents, including David Collins, who took a statement from Cecelia Shepard (the one described above) regarding the movements and description of the killer. 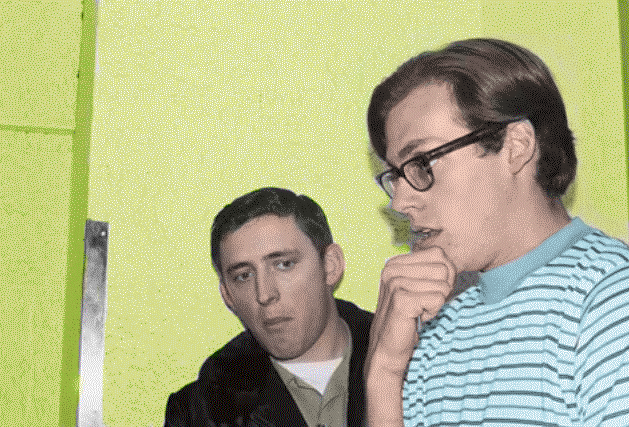 At this point David Collins and both victims were unaware that this crime was the work of the Zodiac Killer, only that an assailant had brutally stabbed the young couple. Detective Sergeants Kenneth Narlow and Richard Lonergan were contacted regarding the attack at 8.20 pm, at which time the ambulance would have been approaching mid route to the hospital and both officers were sent to see if they could interview the couple. ​Both proceeded to the Queen of the Valley Hospital for investigative purposes, where the stricken couple were being taken. The two victims arrived at the hospital at 8.50 pm. Although the couple survived the initial attack, Cecelia Shepard succumbed two days later at the Queen of the Valley Hospital, from cerebral anoxia, due to internal and external hemorrhage from the knife wounds. The following day, during an interview with Sergeant John Robertson, at the Queen of the Valley Hospital, Hartnell stated that during his conversation with the killer, the man had said, "I just got out of ......some prison in Montana", with Hartnell trying to recollect the name of the prison, and said "its some double name, like Fern Lock or something." When aided by Sgt John Robertson saying, "Its Lodge", Hartnell replied: "Oh yeah, yeah at least we know we're together on that", to which the police sergeant said "Mountain Lodge Prison, or something of that nature" and Hartnell replied "Yeah. You know he broke out and had to kill a guard getting out". 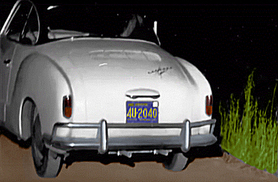 A representation of the 1956 White Karmann Ghia with the Zodiac signature. Click to enlarge photograph. ​It has been speculated that the prison mentioned by the killer was Deer Lodge Prison in Montana, however this may have been arrived at by leading questions being thrown at Bryan Hartnell from the investigator while he was still recovering under heavy sedation and cannot therefore be wholly relied upon as fact. Bryan Hartnell described his attacker as having brown hair, 225-250 lbs in weight and 5'8'' - 5'10'' in height, but admitted he was a bad judge of height because he was so tall. Bryan also stated that the assailant had a unique way of talking, describing it as a drawl, before correcting himself saying "Well not a drawl, an accent". He further stated the assailant wore a black hooded mask made of a cloth material, covering his entire head and shoulders, reaching down to the waist. On the front of the four cornered mask at the chest area was a white circle (3 x 3 inches inches in diameter) and a symmetrical cross. In the police report Bryan Hartnell backed up Cecelia Shepard "He could see hair through the mask's eyelets and observed the hair to be dark brown." Bryan Hartnell in the 2007 documentary remarks that Cecelia Shepard "saw a man over there" and "he went behind a tree." He went on to say "I'll tell you another thing that probably made me think that it was somebody over there, it wasn't an improved park site, there wasn't regular established bathroom, so if you had to go to the restroom you'd just kinda get outta eye-shot of whoever you were with or go behind a tree like that." Cecelia Shepard was still conscious when Deputy Dave Collins arrived on the scene, and was told by Shepard that her assailant was "just may'be a little taller than you, may'be an inch". Deputy Collins was 5'10''. ​It would be later that Sergeant David Collins would head towards the roadside to examine the tire impressions and car door. He said "After the ambulance took the victims to the hospital in Napa (remember it arrived at approximately 7.55 pm, so likely left around 8.05 pm, to arrive at the Queen of the Valley Hospital at 8.50 pm), and while waiting for detectives from the Sheriff's Department to arrive Deputy Land talked to the witnesses and obtained statements from them. I began a search for evidence and discovered a footprint that led from Berryessa Knoxville Road to the victims and back again, which was totally separate from the shoes that they were wearing. 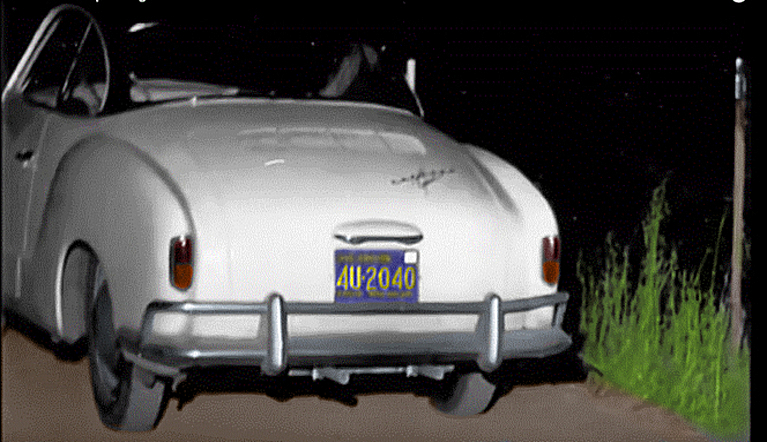 When I went to the roadway I saw the white Karmann Ghia and I saw tracks leading away from it." He further added "I looked at the Karmann Ghia, and on the passenger door the circle with the vertical and horizontal line through it was displayed on the door and there were several dates, and then it ended with September 27th 1969, 6:30 pm, by knife, which was our crime, so he had left his calling card, which is what he had done. I recognized the symbol on the door as being the same symbol she had described on the hood." 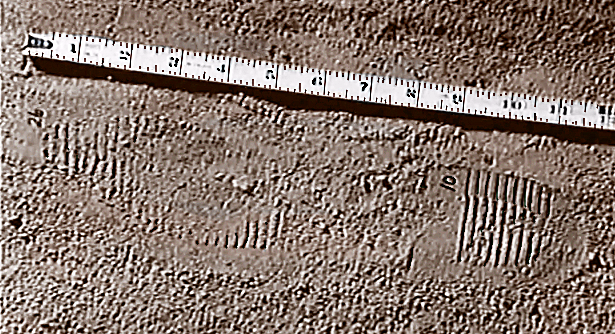 The assailant left visible footprints to and from the crime scene, later believed to be a 10 and one half style military boot called Wing Walkers. The distance from the Karmann Ghia to the crime scene was approximately 510 yards. 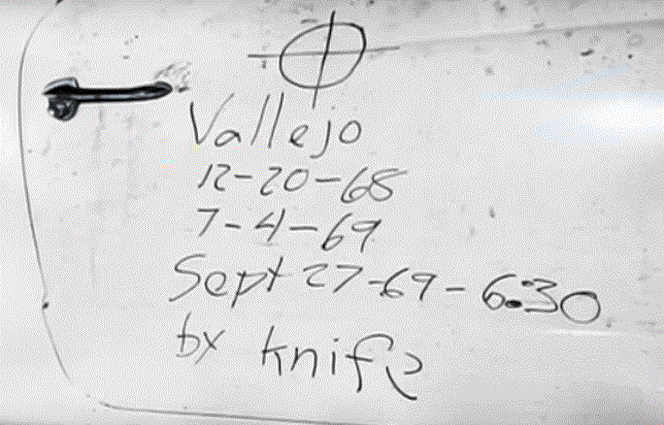 But in what became a familiar trait throughout the Zodiac investigation the killer left a message, this time on the couple's car door, written with a black marker pen. After the attack the killer drove to the 1231 Main Street phone booth, 27 miles away in downtown Napa and placed a call at 7.40 pm to the Napa Police Department, claiming responsibility and knowledge of the latest attack. Officer Dave Slaight took the call and heard the killer utter the words: "I want to report a murder, no, a double murder. They are two miles north of Park Headquarters. They were in a white Volkswagen Karmann Ghia" and after a brief pause uttered the words "I'm the one that did it". At 8.35 pm Officer Kenneth Narlow was informed by Station One that the possible suspect in the double stabbing had placed the payphone call to Dave Slaight from the intersection of Main Street and Clinton Street in Napa, outside of a car wash. Kenneth Narlow duly contacted Deputy Harold Snook and immediately dispatched him to the payphone to process for evidence, where a palm print was retrieved, although it was later unable to supply any matches. The autopsy report on Cecelia Shepard read 'Dr DE Petris further stated that after examining the wounds inflicted on Miss Shepard it was his opinion that the weapon used would be from 9 to 11 inches in length and one inch in width and possibly sharpened on both sides on the top of the blade similar to a bayonet type weapon. In addition the wounds indicated it would be a heavy or sturdy type blade'. View Zodiac news footage from 1969 including interview with Bryan Hartnell. Earlier on in the day, three young women, students of Pacific Union College parked their vehicle at the A & W in St Helena, and within seconds of leaving their vehicle, a white male, driving a silver or light blue Chevrolet 2-door sedan with California plates pulled up to the rear of their car, bumper to bumper, yet remained inside his vehicle. This man would again come into play once the girls had headed off to Lake Berryessa, where it is believed they noticed the same man approximately 50 feet away, observing them sunbathing. Each time they looked at him he seemingly evaded eye contact, thus drawing suspicion from the three women. 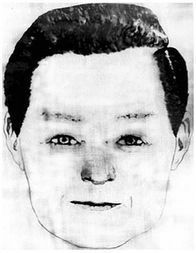 He was described as being between 28 and 40 years, 200 - 225 pounds, 6 feet tall, styled black hair, with rounded eyes and thin lips, he was good looking, with a muscular or stocky build, wearing dark pants and a dark pullover shirt. He remained observing them, by their accounts, for between 30 - 45 minutes. But in a curious observation, one of the girls thought he was wearing a white belt around his back, or possibly what could have been a tee shirt hanging out. Another girl stated he was wearing a black short sleeved sweater shirt, bunched up at the front, again describing a white tee shirt hanging out the back. ​Did the bunched up sweater shirt hide anything sinister. Bryan Hartnell thought the attacker to be 20-30 years, with dark brown hair visible through the hood, wearing dark blue or black pleated slacks, 5' 8" - 6' 0" tall and 225 - 250 pounds. He also noticed a knife in a case on the right side of his belt, near the front of his trousers and cut up rope in the assailant's rear pocket. It was the type similar to white plastic clothesline. Could the descriptions given by two of the girls, describing a white belt around his back or white tee shirt 'hanging out', actually have been the cut lengths of plastic clothesline trailing from his rear pocket in anticipation of a prepared attack on the girls, but for whatever reason got cold feet, changed his mind and turned to Bryan Hartnell and Cecelia Shepard approximately two hours later. ​#1. "A subject driving a late model silver-blue Chevrolet, 2-door sedan. This subject was described as 6' tall, weighing 200/210 pounds, muscular build, rather nice looking." MORE THAN JUST "BY KNIFE"
The police reporting and press coverage following the Lake Berryessa attack held back key information about the crime, so as to validate any possible future contact from the killer. A portion of the the car door in evidence, had been covered over to conceal the phrase 'by knife,' and reporting of the crime also left out this key piece of information, as seen here in a Tuscaloosa news article from October 17th 1969. However, despite this attack being the most theatrical offering from the Zodiac Killer, he failed to capitalize on this crime in subsequent communications with the San Francisco Chronicle, never once directly referring to the Lake Berryessa stabbings. 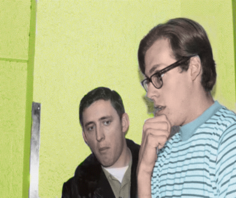 The Zodiac Killer would wait only two weeks to commit hid fifth murder in ten short months, when in San Francisco, where he callously executed taxicab driver Paul Stine on October 11th 1969. 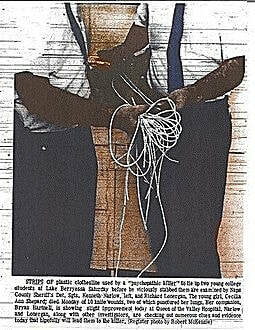 In this crime he had no difficultly in resuming his correspondence with newspapers, mailing a letter to the San Francisco Chronicle just two days after the murder, including a torn bloodied section of Paul Stine's shirt within the correspondence, to validate its authenticity. 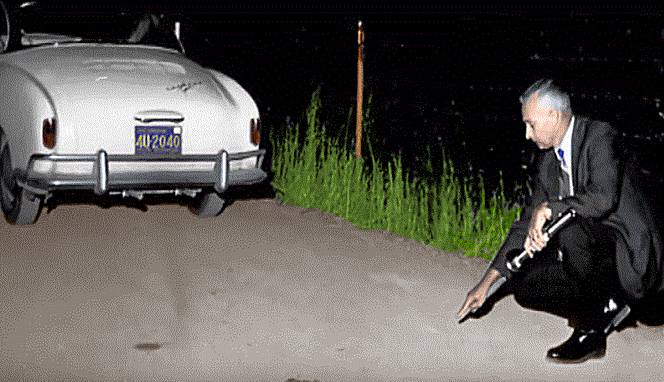 This would be the last confirmed murder of the Zodiac Killer. Click to enlarge photograph. Bryan Calvin Hartnell was a student at Pacific Union College in Angwin. 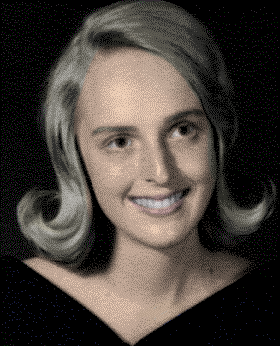 Cecelia Ann Shepard was a student at the University of California in Riverside. Both had been enjoying a day out by the shores of Lake Berryessa, just off the Knoxville Road, when the calm was shattered by a ruthless killer. Both victims were stabbed numerous times. The victims initially survived the attack and were taken by Piner's Ambulance to the Queen of the Valley Hospital, arriving at 8.50 pm. 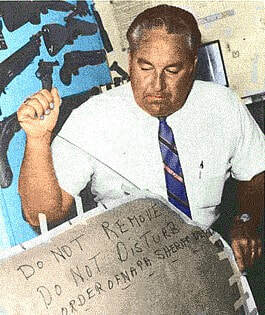 Bryan Hartnell survived to recount his story, but unfortunately Cecelia Shepard died two days later. Deer Lodge Prison in Montana. Click photograph for details on Wikipedia. Click here for Zodiac documentary. In 2007 Bryan Hartnell recalled memories from that fateful day at Lake Berryessa. Plus interviews from law enforcement and their recollections from September 27th 1969.